Area Covered : 1,200 sq-km. Ideal Time to Visit the Park : From November 15 to June 15. Corbett remains closed between June 16 and November 14, during the monsoons. Some Major Accesses : Dhikala is about 300 km from Delhi, 145 km from Lucknow and 51 km from Ramnagar. Where is the Corbett National Park? 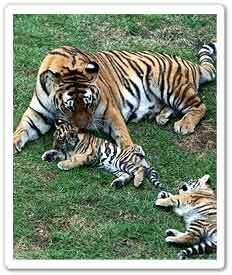 The Corbett National Park is located in the foothills of the majestic Himalayas in the state of Uttranchal in India. The Corbett National Park is home to a variety of flora and fauna. 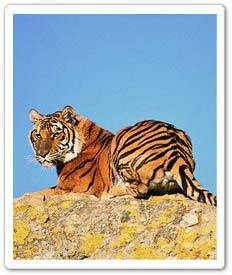 It is famous for its wild population of Tigers, Leopards and Elephants. Once a popular hunting ground of the British, the Corbett National Park was named in honour of the late Jim Corbett, the legendary hunter-naturalist turned author and photographer, who spent most of his years in this area and contributed in setting up the park. Temperature in winter's can go down to 4 degrees centigrade at night and the entire jungle is extremely dry in the summer months as the temperatures reach as high as 44 degrees centigrade. Rainfall: 1400mm-2800mm. Corbett National Park was established in 1936, as the Hailey National Park. With the help of the World Wildlife Fund, Project Tiger was launched in Corbett National Park in 1973 and this park was one of the first such tiger reserves in the country. India's first national park and the first sanctuary to come under Project Tiger, Corbett National Park exhibits a variety of vegetation making it the ideal habitat for the Tiger and its prey. The varied topography comprises hilly and riverine areas, temporary marshy depressions, plateaus and ravines. 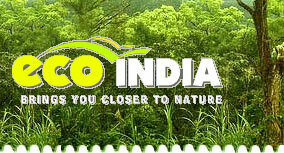 In the Jim Corbett National Park are found 110 tree species, 50 mammals species, 580 bird species and 25 reptile species. A majority of the vegetation in Corbett consists of Sal trees (Shorea robusta), mainly in the lower regions. The higher regions have a larger variety of plants and trees. Some of these are the Chir (Pinus roxburghii), anauri (Legestroemia paruiflora) and Bakli (Anogeissus latifolia). Also found in various parts of the park are many different varieties of bamboo. One plant, (actually a weed) which is a major irritant to the park authorities and is widespread in the jungle is the Lantana. Corbett is a haven for Tigers as well as its prey, which include four kinds of Deer, Wild Boar and some lesser-known animals. Apart from Tigers, Elephants, Leopards / Panthers, Jungle cats, Royal Bengal Tigers, Fishing Cats, Leopard cats, Himalayan black bears, Sloth bears, Jackals, Martens, Dholes, Civets, Mongooses, Otters, Hares, Porcupines, Chital (spotted deer), Sambar deer, Hog deer, Barking deer, Ghorals, Wild Boars, Pangolins, Macaques, Langurs and Blue Bulls (Nilgais) are some of the species which are found here. Herons, Darters, Cormorants, Lapwings, Paradise Flycatchers, Munias, Weaver birds, Fishing eagles, Serpent eagles, Spotted Eagles, Black throated Payas, Mynas, Indian Roller, Jungle Fowl, Vultures, Thrushes, Barbets, Peacocks, peahens, Kingfishers, migrant Gulls, Moorhens, Ducks, Geese, Sandpipers, Nightjars, Cuckoos, Woodpeckers, Wagtails, Black winged Kits, Drongos, Doves, Plovers, Black necked Storks, Parakeets, Sarus Crane, Owls, Chir Pheasants, Kalij Pheasants, Grebes, Grey Lags, Snipes, Harriers, Ospreys, Minivets, Babblers, Hornbills, falcons and Stone Curlews. Corbett has nearly 600 bird species officially recorded in it's log books. Goonch, Mahaseer, Trout and many other smaller species are found here. Gharials (fish eating Crocodiles), Mugger Crocodiles, Monitor Lizards, turtles, Cobras, Pythons and the Sal forest Tortoise. The Jim Corbett National Park endorses Jeep Safari, Horse Safari, Bird Safari, Elephant Safari, Fishing safari and the Nature walk. Take an early dawn elephant back safari with an authorized mahout guide. Jeeps Safari, is the most convenient and comfortable way to travel within Corbett National Park. Jeep rides can be arranged at the Tourist Centre. Although jeeps penetrate deeper into the forest than elephants, they cannot get nearly as close to the wild animals. The jeeps can be rented for the park trips from Ramnagar, from the KMVN Tourist Lodge and other travel agencies. How to Reach Corbett National Park? Air : Phoolbagh, Pantnagar at a distance of 50 km is the nearest airport. Delhi at a distance of 300 km is the nearest international airport. Rail : Ramnagar is on the broad gauge track from where the road transport options have to be availed to reach the park. For faster trains and connections to other parts of India change at Moradabad. Road :Dhikala is 300 km from Delhi, 145 km from Lucknow and 51 km from Ramnagar. Ramnagar is served by frequent buses to and from Nainital and Ranikhet, 112 km north. Buses arrive every half hour or so after the eight hour trip from Delhi; Delhi Transport corporation also runs semi deluxe services.